The global chronic obstructive pulmonary disease (COPD) treatment market is driven by increase in the number of COPD cases, rise in FDA approvals, and launch of several products in the U.S. Moreover, increase in the geriatric population and rise in expenditure on pharmaceuticals in emerging countries are the other factors contributing to the growth of the market. However, patent expiry of branded products and availability of generic equivalents and alternative treatment options are anticipated to restrain the global market. Based on drug class, the global chronic obstructive pulmonary disease treatment market has been segmented into combination, bronchodilators, corticosteroids, phosphodiesterase type 4 inhibitors, mucokinetics, and others. The combination segment has been classified into long acting muscarinic antagonist & inhaled corticosteroids (LAMA-ICS), long acting beta agonist & inhaled corticosteroids (LABA-ICS), triple therapy, and others. The bronchodilators segment has been divided into long acting beta agonist (LABA), short acting beta agonist (SABA), and long acting muscarinic antagonist (LAMA). The combination segment is projected to account for major share of the market by 2026 due to increase in number of physicians prescribing combination therapy and surge in the number of drugs available for COPD treatment. The bronchodilators segment is anticipated to grow at a steady pace owing to increase in the adoption of long acting muscarinic antagonist (LAMA) drugs. In terms of distribution channel, the market has been categorized into hospital pharmacies, retail pharmacies, and online pharmacies. The retail pharmacies segment is expected to expand at the fastest CAGR due to surge in the number of patients preferring retail pharmacies. The online pharmacies segment is likely to be driven by rise in awareness about these pharmacies among the general population. Based on region, the global chronic obstructive pulmonary disease (COPD) treatment market has been segmented into North America, Europe, Asia Pacific, Latin America, and Middle East & Africa. North America accounted for the largest share of the global market in 2017. Presence of established pharmaceutical companies, increase in adoption of new drugs launched in the market, and focus on launch of new products through R&D are anticipated to drive the market in the region during the forecast period. The chronic obstructive pulmonary disease (COPD) treatment market in Europe is driven by increase in R&D expenditure and launch of new products. In November 2018, GlaxoSmithKline plc and Innoviva, Inc. received authorization from the European Commission for expanded use for once-daily Trelegy Ellipta, first single inhaler triple therapy indicated for COPD patients who were not adequately treated with dual bronchodilation. Rise in prevalence of COPD, high environmental pollution, increase in the geriatric population, and growth of the pharmaceutical industry are anticipated to fuel the growth of the chronic obstructive pulmonary disease (COPD) treatment market in Asia Pacific. An article published in the International Journal of Pulmonary and Respiratory Sciences stated that COPD is the third leading cause of death in India. The chronic obstructive pulmonary disease (COPD) treatment market in Latin America and Middle East & Africa is expected to be driven by increase in awareness about the diagnosis and treatment of COPD, rise in the number of government initiatives to spread awareness and importance about its treatment, and surge in the number of specialty care centers for respiratory care in various countries in the Middle East. Additionally, GCC Countries such as the UAE and Saudi Arabia present significant opportunities in the market due to strengthening health care system and availability of quality care in hospitals. Major players operating in the global chronic obstructive pulmonary disease (COPD) treatment market include AstraZeneca, Boehringer Ingelheim Pharmaceuticals, Inc., GlaxoSmithKline plc, Novartis AG, CHIESI Farmaceutici S.p.A., Sunovion Pharmaceuticals, Inc. (Sumitomo Dainippon Pharma Co., Ltd), Teva Pharmaceutical Industries Ltd., Mylan N.V., and Orion Corporation. This report analyzes the current and future scenario of the global chronic obstructive pulmonary disease (COPD) treatment market. Rise in prevalence of COPD, increase in the adoption of combination therapy, and surge in awareness about COPD treatment are the key factors anticipated to drive the global market. Additionally, increase in the geriatric population, rise in importance of COPD management, and surge in the number of respiratory care centers contribute to the growth of the global market. According to the Global Initiative for Asthma (GINA) 2018, COPD is the third leading cause of death in the U.S., with large portion of population being undiagnosed. The global chronic obstructive pulmonary disease treatment market report comprises an elaborate executive summary, which includes a snapshot that provides information about various segments of the market. It also provides information and data analysis of the global market with respect to the segments based on drug class, distribution channel, and region. A detailed qualitative analysis of drivers and restraints of the market, and opportunities has been provided in the overview section. Additionally, the section comprises competitive matrix and company profiles along with business overview to understand the competitive landscape in the market. This section of the report also provides market attractiveness analysis by region and market share analysis by key players, thereby presenting a thorough analysis of the overall competitive scenario in the global chronic obstructive pulmonary disease treatment market. New drug development by market players through collaborations and increase in research and development expenditure are anticipated to drive the global market. In February 2016, Propeller Health and Novartis Pharma AG entered into collaboration to develop a custom add-on sensor for the Breezhaler inhaler, a device indicated for COPD treatments. This collaboration aims to connect these medications to Propeller’s digital health platform.. In terms of drug class, the global chronic obstructive pulmonary disease treatment market has been segmented into combination, bronchodilators, corticosteroids, phosphodiesterase type 4 inhibitors, mucokineticsm and others. The combination segment has been divided into long acting muscarinic antagonist & inhaled corticosteroids (LAMA-ICS), long acting beta agonist & inhaled corticosteroids (LABA-ICS), triple therapy, and others. The bronchodilators segment has been classified into long acting beta agonist (LABA), short acting beta agonist (SABA), and long acting muscarinic antagonist (LAMA). Based on distribution channel, the market has been categorized into hospital pharmacies, retail pharmacies, and online pharmacies. The retail pharmacies segment is projected to expand at the fastest CAGR due to increase in the number of patients preferring retail pharmacies. The market size and forecast for each of these segments have been provided for the period from 2016 to 2026, along with their respective CAGRs for the forecast period from 2018 to 2026, considering 2017 as the base year. 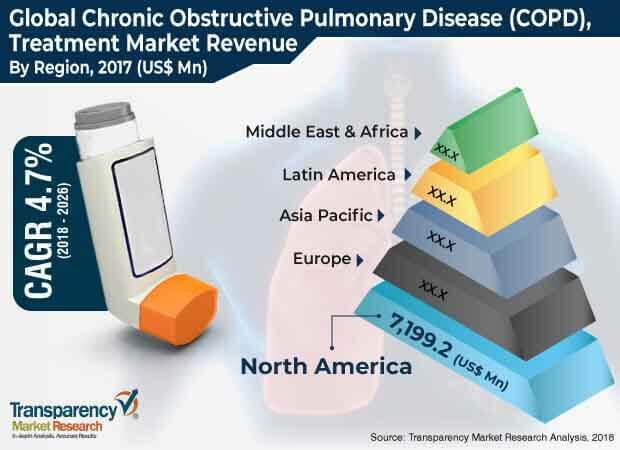 In terms of region, the global chronic obstructive pulmonary disease treatment market has been segmented into North America (U.S. and Canada), Europe (U.K., Germany, France, Spain, Italy, and Rest of Europe), Asia Pacific (India, China, Japan, Australia & New Zealand, and Rest of Asia Pacific), Latin America (Brazil, Mexico, and Rest of Latin America), and Middle East & Africa (South Africa, GCC Countries, Israel, and Rest of Middle East & Africa). The market size and forecast for each of these regions and the mentioned countries/sub-regions have been provided for the period from 2016 to 2026, along with their respective CAGRs for the forecast period from 2018 to 2026, considering 2017 as the base year. The research study also covers the competitive scenario in these regions. The report also profiles major players in the global chronic obstructive pulmonary disease treatment market based on various attributes such as company overview, financial overview, product portfolio, business strategies, and recent developments. Key players profiled in the market report include AstraZeneca, Boehringer Ingelheim Pharmaceuticals, Inc., GlaxoSmithKline plc, Novartis AG, CHIESI Farmaceutici S.p.A., Sunovion Pharmaceuticals, Inc. (Sumitomo Dainippon Pharma Co., Ltd), Teva Pharmaceutical Industries Ltd, Mylan N.V., and Orion Corporation.